Home » abraham Lincoln! » assassinate » John WIlkes Booth's » President » John WIlkes Booth's .44 Derringer used to assassinate President Lincoln! John WIlkes Booth's .44 Derringer used to assassinate President Lincoln! John Wilkes Booth killed President Lincoln with a shot in the back of the head near his left ear. This pistol was the weapon he used. 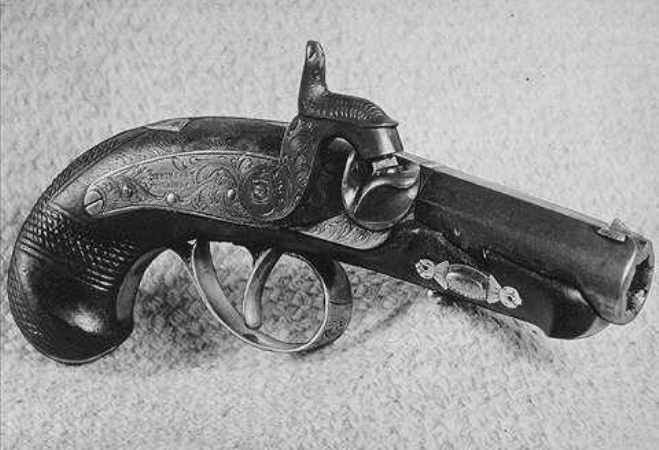 Manufactured by Henry Derringer, this .44 caliber is about 6 inches long with a 2 1/2 inch barrel and only weighs 8 ounces. The weapon was found on the floor of the State Box in Ford's Theatre after the assassination, but it located today in the basement of Ford's Theatre. John Wilkes Booth (May 10, 1838 – April 26, 1865) was an American stage actor who assassinated President Abraham Lincoln at Ford's Theatre, in Washington, D.C., on April 14, 1865. Booth was a member of the prominent 19th century Booth theatrical family from Maryland and, by the 1860s, was a well-known actor. He was also a Confederate sympathizer vehement in his denunciation of the Lincoln Administration and outraged by the South's defeat in the American Civil War. He strongly opposed the abolition of slavery in the United States and Lincoln's proposal to extend voting rights to recently emancipated slaves. Booth and a group of co-conspirators planned to kill Lincoln, Vice President Andrew Johnson, and Secretary of State William Seward in a bid to help the Confederacy's cause. Although Robert E. Lee's Army of Northern Virginia had surrendered four days earlier, Booth believed the war was not yet over because Confederate General Joseph E. Johnston's army was still fighting the Union Army. Of the conspirators, only Booth was completely successful in carrying out his respective part of the plot. Seward was wounded but recovered; Lincoln died the next morning from a single gunshot wound to the back of the head. Following the shooting, Booth fled on horseback to southern Maryland, eventually making his way to a farm in rural northern Virginia 12 days later, where he was tracked down and shot by Boston Corbett, a Union soldier who acted against orders. Eight others were tried and convicted, and four were hanged shortly thereafter. Over the years, various authors have suggested that Booth escaped his pursuers and subsequently died many years later under a pseudonym. Booth invested some of his growing wealth in various enterprises during the early 1860s, including land speculation in Boston's Back Bay section. He also started a business partnership with John Ellsler, manager of the Cleveland Academy of Music, and another friend, Thomas Mears, to develop oil wells in northwestern Pennsylvania, where an oil boom had started in August 1859, following Edwin Drake's discovery of oil there. Initially calling their venture Dramatic Oil (later renaming it Fuller Farm Oil), the partners invested in a 31.5-acre (12.7 ha) site along the Allegheny River at Franklin, Pennsylvania, in late 1863 for drilling. By early 1864, they had a producing 1,900-foot (579 m) deep oil well, named Wilhelmina for Mears' wife, yielding 25 barrels (4 kL) of crude oil daily, then considered a good yield. The Fuller Farm Oil company was selling shares with a prospectus featuring the well-known actor's celebrity status as "Mr. J. Wilkes Booth, a successful and intelligent operator in oil lands", it said. The partners, impatient to increase the well's output, attempted the use of explosives, which wrecked the well and ended production. Booth, already growing more obsessed with the South's worsening situation in the Civil War and angered at Lincoln's re-election, withdrew from the oil business on November 27, 1864, with a substantial loss of his $6,000 ($81,400 in 2010 dollars) investment. As the 1864 Presidential election drew near, the Confederacy's prospects for victory were ebbing and the tide of war increasingly favored the North. The likelihood of Lincoln's re-election filled Booth with rage towards the President, whom Booth blamed for the war and all the South's troubles. Booth, who had promised his mother at the outbreak of war that he would not enlist as a soldier, increasingly chafed at not fighting for the South, writing in a letter to her, "I have begun to deem myself a coward and to despise my own existence". He began to formulate plans to kidnap Lincoln from his summer residence at the Old Soldiers Home, three miles (5 km) from the White House, and to smuggle him across the Potomac River into Richmond. Once in Confederate hands, Lincoln would be exchanged for the release of Confederate Army prisoners of war held captive in Northern prisons and, Booth reasoned, bring the war to an end by emboldening opposition to the war in the North or forcing Union recognition of the Confederate government. The Old Soldiers Home, where Booth planned to kidnap LincolnIn October, Booth made an unexplained trip to Montreal, which was then a well-known center of clandestine Confederate activity. He spent ten days in the city, staying for a time at St. Lawrence Hall, a rendezvous for the Confederate Secret Service, and meeting several Confederate agents there. No conclusive proof has linked Booth's kidnapping or assassination plots to a conspiracy involving the leadership of the Confederate government, although historians such as David Herbert Donald have said, "It is clear that, at least at the lower levels of the Southern secret service, the abduction of the Union President was under consideration". Historian Thomas Goodrich concluded that Booth entered the Confederate Secret Service as a spy and courier. Other writers exploring possible connections between Booth's planning and Confederate agents include Nathan Miller's Spying For America and William Tidwell's Come Retribution: the Confederate Secret Service and the Assassination of Lincoln. After Lincoln's landslide re-election in early November 1864 on a platform advocating passage of the 13th Amendment to the U.S. Constitution to abolish slavery altogether, Booth devoted increasing energy and money to his kidnap plot. He assembled a loose-knit band of Southern sympathizers, including David Herold, George Atzerodt, Lewis Powell (also known as Lewis Payne or Paine), and John Surratt, a rebel agent. They began to meet routinely at the boarding house of Surratt's mother, Mrs. Mary Surratt. By this time, Booth was arguing so vehemently with his older, pro-Union brother Edwin about Lincoln and the war that Edwin finally told him he was no longer welcome at his New York home. Booth also railed against Lincoln in conversations with his sister Asia, saying, "That man's appearance, his pedigree, his coarse low jokes and anecdotes, his vulgar similes, and his policy are a disgrace to the seat he holds. He is made the tool of the North, to crush out slavery." As the Confederacy's defeat became more certain in 1865, Booth decried the end of slavery and Lincoln's election to a second term, "making himself a king", the actor fumed, in "wild tirades", his sister recalled. Booth attended Lincoln's second inauguration on March 4 as the invited guest of his secret fiancée, Lucy Hale. In the crowd below were Powell, Atzerodt, and Herold. There was no attempt to assassinate Lincoln during the inauguration. Later, however, Booth remarked about his "excellent chance ... to kill the President, if I had wished". On April 12, 1865, after hearing the news that Robert E. Lee had surrendered at Appomattox Court House, Booth told Louis J. Weichmann, a friend of John Surratt, and a boarder at Mary Surratt's house, that he was done with the stage and that the only play he wanted to present henceforth was Venice Preserv'd. Weichmann did not understand the reference: Venice Preserv'd is about an assassination plot. With the Union Army's capture of Richmond and Lee's surrender, Booth's scheme to kidnap Lincoln was no longer feasible, and he changed his goal to assassination. On the morning of Good Friday, April 14, 1865, Booth went to Ford's Theatre to get his mail; while there he was told by John Ford's brother that President and Mrs. Lincoln accompanied by Gen. and Mrs. Ulysses S. Grant would be attending the play Our American Cousin at Ford's Theatre that evening. He immediately set about making plans for the assassination, which included making arrangements with livery stable owner James W. Pumphrey for a getaway horse, and an escape route. Booth informed Powell, Herold, and Atzerodt of his intention to kill Lincoln. He assigned Powell to assassinate Secretary of State William H. Seward and Atzerodt to assassinate Vice President Andrew Johnson. Herold would assist in their escape into Virginia. By targeting Lincoln and his two immediate successors to the presidency, Booth seems to have intended to decapitate the Union government and throw it into a state of panic and confusion. The possibility of assassinating the Union Army's commanding general as well was foiled when Grant declined the theatre invitation at his wife's insistence. Instead, the Grants departed Washington by train that evening for a visit to relatives in New Jersey. Booth had hoped that the assassinations would create sufficient chaos within the Union that the Confederate government could reorganize and continue the war if one Confederate army remained in the field or, that failing, to avenge the South's defeat. In his 2005 analysis of Lincoln's assassination, Thomas Goodrich wrote, "All the elements in Booth's nature came together at once – his hatred of tyranny, his love of liberty, his passion for the stage, his sense of drama, and his lifelong quest to become immortal. As a famous and popular actor who had frequently performed at Ford's Theatre, and who was well known to its owner, John T. Ford, Booth had free access to all parts of the theater, even having his mail sent there. By boring a spyhole into the door of the presidential box earlier that day, the assassin could check that his intended victim had made it to the play and observe the box's occupants. That evening, at around 10 p.m., as the play progressed, John Wilkes Booth slipped into Lincoln's box and shot him in the back of the head with a .44 caliber Derringer. Booth's escape was almost thwarted by Major Henry Rathbone, who was present in the Presidential box with Mrs. Mary Todd Lincoln. Booth stabbed Rathbone when the startled officer lunged at him. Rathbone's fiancée, Clara Harris, who was also present in the box, was unhurt. Booth then jumped from the President's box to the stage, where he raised his knife and shouted "Sic semper tyrannis" (Latin for "Thus always to tyrants", attributed to Brutus at Caesar's assassination and the Virginia state motto), while others said he added, "I have done it, the South is avenged!" Various accounts state that Booth injured his leg when his spur snagged a decorative U.S. Treasury Guard flag while leaping to the stage. Historian Michael W. Kauffman questioned this legend in his book, American Brutus: John Wilkes Booth and the Lincoln Conspiracies, writing in 2004 that eyewitness accounts of Booth's hurried stage exit made it unlikely that his leg was broken then. Kauffman contends that Booth was injured later that night during his flight to escape when his horse tripped and fell on him, calling Booth's claim to the contrary an exaggeration to portray his own actions as heroic. Guns in Booth's possession when he was captured/killed.Conger tracked down Jett and interrogated him, learning of Booth's location at the Garrett farm. Before dawn on April 26, the soldiers caught up with the fugitives, who were hiding in Garrett's tobacco barn. David Herold surrendered, but Booth refused Conger's demand to surrender, saying "I prefer to come out and fight"; the soldiers then set the barn on fire. As Booth moved about inside the blazing barn, Sergeant Boston Corbett shot him. According to Corbett's later account, he fired at Booth because the fugitive "raised his pistol to shoot" at them. Conger's report to Stanton, however, stated that Corbett shot Booth "without order, pretext or excuse", and recommended that Corbett be punished for disobeying orders to take Booth alive. Booth, fatally wounded in the neck, was dragged from the barn to the porch of Garrett's farmhouse, where he died three hours later, aged 26. The bullet had pierced three vertebrae and partially severed his spinal cord, paralyzing him. In his dying moments, he reportedly whispered, "Tell my mother I died for my country". Asking that his hands be raised to his face so he could see them, Booth uttered his last words, "Useless, useless," and died as dawn was breaking. In Booth's pockets were found a compass, a candle, pictures of five women (actresses Alice Grey, Helen Western, Effie Germon, Fannie Brown, and Booth's fiancée Lucy Hale), and his diary, where he had written of Lincoln's death, "Our country owed all her troubles to him, and God simply made me the instrument of his punishment." "I know how foolish I shall be deemed for undertaking such a step as this, where, on one side, I have many friends and everything to make me happy ... to give up all ... seems insane; but God is my judge. I love justice more than I do a country that disowns it, more than fame or wealth." Booth's letter, seized along with other family papers at Asia's house by Federal troops and published by The New York Times while the manhunt was underway, explained his reasons for plotting against Lincoln. In it he said, "I have ever held the South was right. The very nomination of Abraham Lincoln, four years ago, spoke plainly war upon Southern rights and institutions." The institution of "African slavery", he had written, "is one of the greatest blessings that God has ever bestowed upon a favored nation" and Lincoln's policy was one of "total annihilation". The Historic Site marker on U.S. Route 301 near Port Royal, where the Garrett barn and farmhouse once stood in what is now the highway's medianBooth's body was shrouded in a blanket and tied to the side of an old farm wagon for the trip back to Belle Plain. There, his corpse was taken aboard the ironclad USS Montauk and brought to the Washington Navy Yard for identification and an autopsy. The body was identified there as Booth's by more than ten people who knew him. Among the identifying features used to make sure that the man that was killed was Booth was a tattoo on his left hand with his initials J.W.B., and a distinct scar on the back of his neck. The third, fourth, and fifth vertebrae were removed during the autopsy to allow access to the bullet. These bones are still on display at the National Museum of Health and Medicine in Washington, D.C. The body was then buried in a storage room at the Old Penitentiary, later moved to a warehouse at the Washington Arsenal on October 1, 1867. In 1869, the remains were once again identified before being released to the Booth family, where they were buried in the family plot at Green Mount Cemetery in Baltimore, after a burial ceremony conducted by Fleming James, minister of Christ Episcopal Church, in the presence of more than 40 people. By then, wrote scholar Russell Conwell after visiting homes in the vanquished former Confederate states, hatred of Lincoln still smoldered and "Photographs of Wilkes Booth, with the last words of great martyrs printed upon its borders ... adorn their drawing rooms". Eight others implicated in Lincoln's assassination were tried by a military tribunal in Washington, D.C., and found guilty on June 30, 1865. Mary Surratt, Lewis Powell, David Herold, and George Atzerodt were hanged in the Old Arsenal Penitentiary on July 7, 1865. Samuel Mudd, Samuel Arnold, and Michael O'Laughlen were sentenced to life imprisonment at Fort Jefferson in Florida's Dry Tortugas; Edmund Spangler was given a six-year term in prison. O' Laughlen died in a yellow fever epidemic there in 1867. The others were eventually pardoned in February 1869 by President Andrew Johnson. Forty years later, when the centenary of Lincoln's birth was celebrated in 1909, a border state official reflected on Booth's assassination of Lincoln, "Confederate veterans held public services and gave public expression to the sentiment, that 'had Lincoln lived' the days of reconstruction might have been softened and the era of good feeling ushered in earlier". A century later, Goodrich concluded in 2005, "For millions of people, particularly in the South, it would be decades before the impact of the Lincoln assassination began to release its terrible hold on their lives". The majority of Northerners viewed Booth as a madman or monster who murdered the savior of the Union, while in the South, many cursed Booth for bringing upon them the harsh revenge of an incensed North instead of the reconciliation promised by Lincoln.